REDUCED to $260,000 usd -180 sq.m., 3 bath, 3 bedroom townhouse "3 Levels"
Centro, Playa del Carmen - The sale of this three story townhouse includes two units: a two story town home with two bedrooms, each with ensuite bathrooms as well as an independent, one bedroom, one bath apartment on the third level with full kitchen and separate entrance. Located in one of the most popular downtown “neighborhoods”, close to good schools, the sports complex, produce market and supermarkets, Villa Los Almendros is perfect for a young family or a professional couple relocating to Playa del Carmen. With a large, beautifully landscaped common pool, roof top terrace, eagle's nest '5th Floor' observation deck and attention to every detail, this house is a great choice for anyone who wants to live here in Playa, and perhaps needs a home office or desires a steady rental income. Recently remodeled by the current owners, the facade and side walls were moved outwards and some interior walls removed, creating the most spacious living area possible. Every step of the way, the owners paid close attention to details and the quality of the materials and craftsmanship. From the terracotta floor tiles to the talavera countertops, the handcrafted hardwood cabinets and the carefully planned built-ins, no expense has been spared in the design of this contemporary family home. Both the town house and the upstairs apartment are fully furnished and equipped, and ready to occupy immediately. The independent third level apartment has one large bedroom with king size bed, ample closets, AC, ceiling fans, full bathroom with shower, a fully equipped kitchen with hand painted talavera tiles, fridge/freezer, stove, microwave oven and water cooler. The living and dining areas are fully furnished and there is a balcony overlooking the central pool and gardens. Roof top terrace features a Zapote wood pergola roof for shade, a large storage 'bodega' and an eagle's nest deck with one of the highest observation points in Playa with ocean views. 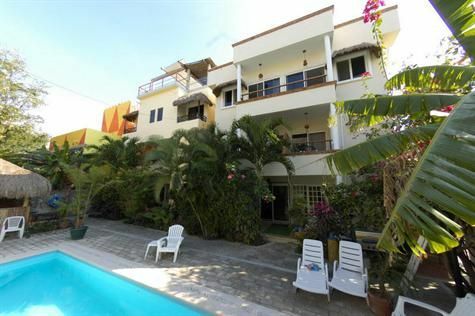 Contact Rob@BuyPlaya .com for more information and to schedule a showing.